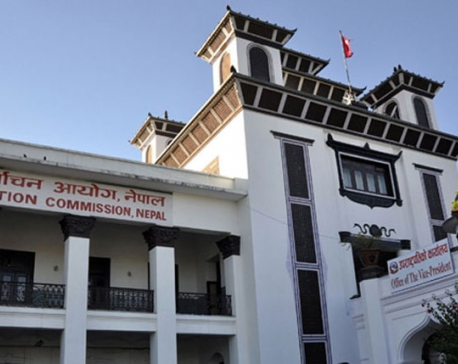 KATHMANDU, Sept 27: The government is preparing to register a new election bill in Parliament that will curtail the jurisdiction of the Election Commission proposed in a draft prepared by the commission itself. The draft prepared by the EC had proposed to give the commission the authority to set election dates. But the bill forwarded by the Ministry of Home Affairs to the Bills Committee has assigned this authority to the government. As per the initial draft, the authority to set poll dates should have resided with the commission except in a situation of parliament’s dissolution by the president. Clause 5 of the draft contained a provision for the Election Commission fixing the dates of elections to be held as per the constitution and federal laws. The proposed provision also envisaged the commission consulting the government before fixing election dates. However, Clause 3 of the bill to be registered in parliament within this week maintains that the government itself will set election dates. Because of the provision on the government setting election dates, elections had been held in the past only at the convenience of political parties. Also because of such a provision, it has been almost two decades since the last local elections were held. Many countries, including neighboring India, have provisions for their election commissions setting the election dates and even doing so without consulting the government. “The draft prepared by the commission was a collective proposal based on the experience of former chief commissioners and commissioners. The commission does not have any further interest in it other than strengthening democracy through periodic elections,” said an EC official. As the constitution itself has set a deadline of January 21, 2018 for holding elections to parliament, the EC has to get at least eight election-related laws in place in time.